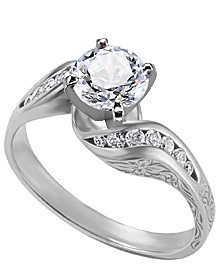 This 18k white gold diamond ring, engraved with a beautiful floral pattern, has 14 round channel set diamond side stones. Each diamond has a color of G-H and a clarity of VS. The total carat weight is .25 ct. ALSO AVAILABLE IN .50 ct.